I've been taking Stanton Orchard's Tart Cherry Juice Concentrate for almost a year. It's available at Whole Foods Mkt for @$26/quart bottle, as well as on line. It's made from 25 lbs. of Montmorency cherries; the serving size, which is also the therapeutic dose, is 2 T, although they list casual ways to use 1 T. at a time. It was recommended to me by a friend who experienced noticeably less pain in an arthritic big toe whenever she ate regular cherries. She picked this up, and found it gave her the same relief as the cherries did, and allowed her to better tolerate the wait between cortisone shots. While I said I'd try it, I was really skeptical about it working for pain that I have. I just tried it to humor her. I have irritated nerves from spinal stenosis, and these cherries are purported to have anti-inflammatory properties. I can't take NSAIDs, because they cause a flare-up of diverticulitis. I began putting 1 tablespoon of this concentrate into @8 ounces of Metamusil ev. 36 hours or so, because I was concerned about the amount of sugar in the syrup: 19 grams in a 2 T./ 30 ml dose. Their website (stantonorchards.com) says not to expect results for about three months. However, after about six months, not noticing anything different, I cut my usage back to 1 T. every other day, and was soon shocked to suddenly experience a very noticeable burning sensation along an irritated nerve pathway. That happened whenever I missed a dose, or was off by more than half/day. The burning subsided after I took the missed dose. So, I must say, I went from being a total skeptic to a firm believer, and am now going to try taking the full 2 T/day dose, as well as try switching from morning to evening, in case I can also get a sleep benefit from the melatonin in the cherries. I have been taking TheraCherry for about 4 months and the sharp jabbing pain in my left knee when I walk down a flight a stairs has completely disappeared. Thiis happened in 1-2 weeks. I take 3 capsules a day instead of the 2 recommended on the bottle. I never tried 2 since I wanted help as soon as possible. Perhaps 2 capsules a day would also work. I have used tart cherry for gout pain for over 20 years and for me it works very well! But it works only by dissolving uric acid gristals in joints and so takes away that painfull "fine sand" causing the pain! Nowadays I use JOINT FORMULA in Australia;health food stores ,ca.$30 per litre.And I cannot find any evidence that it works on any type of artritis or other pains:only in gout pain by dissolving uric acid gristal from joints! That is why there is no scientific evidence for anything else! For several years I have taken tart cherry extract capsules for my osteoarthritis. I also take other OTC remedies including turmeric, glucosamine and chondroitin and find that they help me considerably with my joint pain. If I stop taking any one of them, I start feeling more achy after a few weeks. My question is with the tart cherry. I just ordered some from Vitacost (Vitacost brand) and they came with a warning label saying "Warning: This product contains chemicals known to the State of California to cause cancer and birth defects or other reproductive harm." There was no notice of this on the Vitacost website so I found it pretty disturbing. Do tart cherry extracts in general contain this (unknown) cancer or birth defect causing chemical or is it just this particular one? I wish you would test the capsules for such chemicals and also for their content of anthocyanin which don't seem to be listed on the labels unless anthocyanin are the same as flavonoids. I think the label referred to pesticides . Cherries absorb more of those pesticides than others fruits do . It really penetrate the fruit skin. What I am hearing is that the fruit, tart cherries is the best way to reduce inflammation when it comes to helping osteoarthritis as opposed to tart cherry juice. I am wondering why the big difference. is it because the juice is a concentrate or watered down. Also i tried tart cheery juice and it has a high sugar concentration. Hi Paula - Most of the research appears to be on tart cherry juice and concentrate, rather than the fresh fruit. However, as you point out, the juice and concentrate do contain sugar, similar to amounts found in some other fruit juices -- we've added information about this to the answer above. Fresh tart cherries can sometimes be difficult to find in stores, but canned and frozen tart cherries are often available. I have seen dried tart cherries in the dried fruit section of the grocery. not all stores but some, and these were regular stores. probably an organic store would carry them too. Cosco carries organic, dried, tart cherries. Least expensive store anywhere! I've heard Tart Cherry Juice reduces cholesterol. Is there any truth to that? Hi Joyce - Thank you for your question. The study mentioned in the answer above which found tart cherry juice to lower levels of uric acid and triglycerides (Martin, FASEB 2011) also reported a significant reduction in "bad" VLDL cholesterol. We've now added this information to the answer. 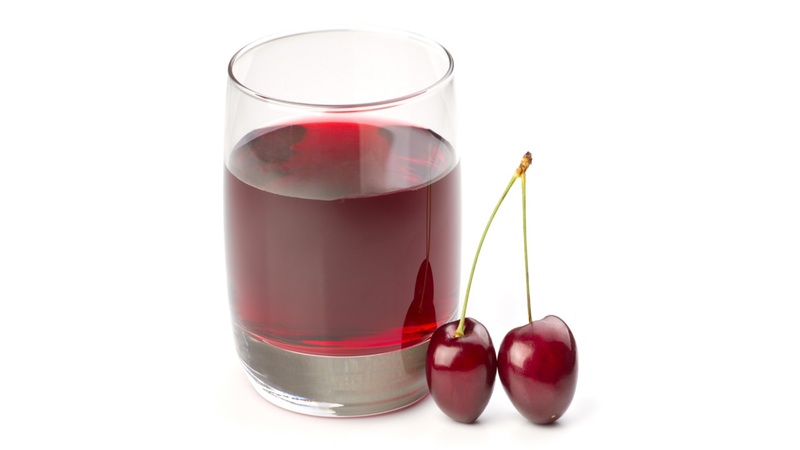 How much Cherry Juice should you consume to reduce cholesterol? Hi Stephen - In the study noted above which found a reduction in very low density lipoprotein (VLDL), 8 ounces of tart cherry juice was consumed daily for four weeks. By sheer accident, about 3 years ago, I drank a half-bottle of FERMENTED (Chere brand) tart-cherry juice-- usually mixed with apple juice to "kill the taste," and found my diabetic BS-readings DRAMATICALLY DROP from the low-200s to the 80s for about a 2.5-week period!! I even had to reduce my Gliptizide intake down to 1/3-dose!!! Hmm, interesting, I've been experimenting with Kiefer, I bought some Keifer granules online and have been adding it to coconut water, to make coconut water Keifer. I wonder if you could make coconut water cherry juice Keifer? This might help counteract excess sugar in the cherry juice concentrate. This actually sounds like it might be tastier than the plain coconut water Kiefer. I have found a small amount of sour cherry syrup concentrate mixed in water - two teaspoons to eight ounces once a week - counter what I perceived to be symptoms of incipient gout in both my large toes. If I go without for three weeks, the pain starts again. This CL Answer initially posted on 6/14/2015. Last updated 7/17/2018.